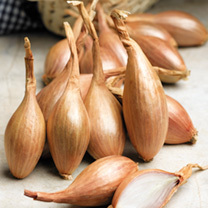 An excellent, slightly elongated shallot, with copper-coloured skins and great tasting pink-tinged flesh. Each bulb yields 6-8 bulbs at harvest. Plant from mid January onwards. RHS Award of Garden Merit winner. Grown in Brittany, in the heart of France’s main shallot growing region, these superb certified varieties are of superior quality and will produce an outstanding crop for you.